The sunny, south-facing slope behind the Stanley Elementary School is the site of this school’s exceptionally “green” garden. 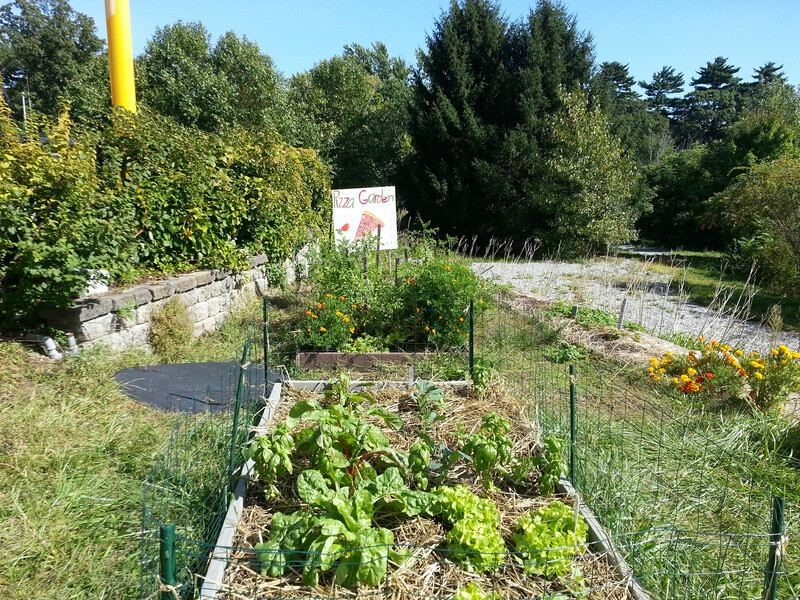 The YMCA after-school Garden Club students and Healthy Waltham planted the first garden beds in 2008. Two terraced garden beds stretch away from the shaded patio outside the cafeteria, where two grape vines and clusters of climbing hydrangea cling to the railing. Along each terrace is a border of perennial flowers such as irises and day lilies, while the middle is used for annual vegetables such as tomatoes, beans, carrots, peas, and lettuce. A pumpkin patch sprawls along the bottom of the slope and is home to a busy bird feeder. The compost pile sits in a shady corner, quietly recycling garden waste into rich nutrients for next year’s plants. The building site incorporates a wild, protected wetland behind the school, contributing to the school’s LEED Silver certification for “green” building and providing the garden with a variety of birds, insects, and mammals to make up a biologically diverse ecosystem and a rich learning environment. This garden is managed by a team of parent volunteers from the school. Check out their blog for more information about this garden and also this article written by Tammy Donroe Inman for the Waltham News Tribune and Healthy Waltham.